Veteran weaves the military’s green movement into his personal life, bringing his family’s utility bill down to ZERO. Strolling by the solar rooftop-lined homes along the streets of veteran Tom Perez and his wife Carol Alverson’s quintessentially Californian neighborhood, it’s easy to admire the neighborhood’s green efforts. We caught up with the couple (married a happy 33 years!) to learn more about their life in San Diego. They divulged in their secrets to a long-lasting marriage and the decision that is saving them thousands of dollars: switching to solar with Solar Optimum. 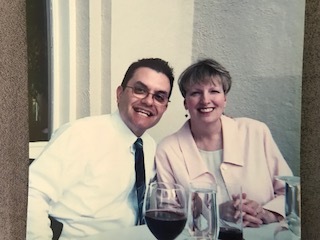 Tom and Carol’s love story began in sun-soaked Arizona in 1983. They were both University of Arizona graduates and new hires for the state of Arizona. Employed in Targeted Job Tax Credits Program, both were eager to help veterans transition back into the workforce, working on measures that offered businesses tax credits for hiring veterans. It was love at first sight for Tom. He saw Carol presenting during their orientation and was enchanted by her charisma and beauty. He won Carol’s heart and they ended up marrying in his hometown of Tucson. Both their backgrounds are very different. Carol was raised in Southern Nevada while Tom grew up a self-proclaimed military brat, moving around every couple of years. However, one thing continuously intertwines their story: Freedom. Tom was a cadet at the United States Military Academy at West Point, embracing the rigorous curriculum and physical requirements needed to progress in the path of becoming a commissioned officer. Boxing was required at the Academy, and he gave it his all. Back then, boxing gloves did not have sewn in thumbs, increasing the risk of vision-threatening injuries. For two years, he dodged, he weaved, and he darted. But frequent hooks from his opponents’ thumb socking him square in the eye caused severe vision trauma. He found freedom from stagnancy by staying nimble, something that would not have been possible without Carol’s support. “She is the love of my life, my caregiver and my compass. She’s been here with me every step of the way.” With the vigor and energy of a young man he unveiled his next pursuit, rock climbing, as Carol chuckled in delight. Freedom from rising utility bills by becoming energy independent and enjoying Energy Peace of Mind. 1) Reduce their carbon footprint. 2) Combat their rising utility bills. A great way to understand solar is by comparing it to buying instead of renting a home. Shifting the money spent on rent into a mortgage turns it into an investment. Applying the same concept to energy usage, you are essentially shifting the money that you spend each month on utility bills into a solar investment that will offer you returns for years to come. Today, after becoming energy independent with Solar Optimum, the generation and delivery charges on their utility bill comes out to a grand total of ZERO. A far cry from the $110 a month they were paying before the switch in spring. 3) The sharp drop in solar technology costs over the last decade. According to the Solar Industries Energy Association, the cost to install solar has dropped by more than 70% since 2010, leading the industry to expand into new markets and deploy thousands of systems nationwide. 4) The many policy factors that make solar feasible in California. Combined with potential state and utility rebates, the net cost for a solar system can be significantly below the actual cost. California’s net metering policy, for instance, credits Tom and Carol’s utility bills for the excess power they generate. Additionally, the Federal Government is heavily involved in helping America become energy independent. A 30% Federal Tax Credit is issued to homeowners in order to encourage them to adopt renewable energy. This credit allows customers to deduct 30% of the cost of installing a solar energy system from federal taxes and there is no cap on its value. This credit is available for a limited time, so Tom and Carol took advantage of this additional incentive by moving quickly. Although Tom and Carol are now retired, they remain involved in environmental stewardship. By going green, they are helping protect and preserve the environment for future generations, making a difference not only here in America, but globally. Even the defense community is incorporating solar in everything from its military bases to submarine battery storage projects. In synchrony with the U.S. Military and Navy’s march forward on green energy, it’s a great season for military families to switch to clean energy. With all this progress being made, it’s an exciting time for Tom and Carol to be part of the green movement. We salute Tom, Carol and all the incredible military families! Solar Optimum wants to make renewable energy accessible to more people, particularly those that serve to protect our country and community. 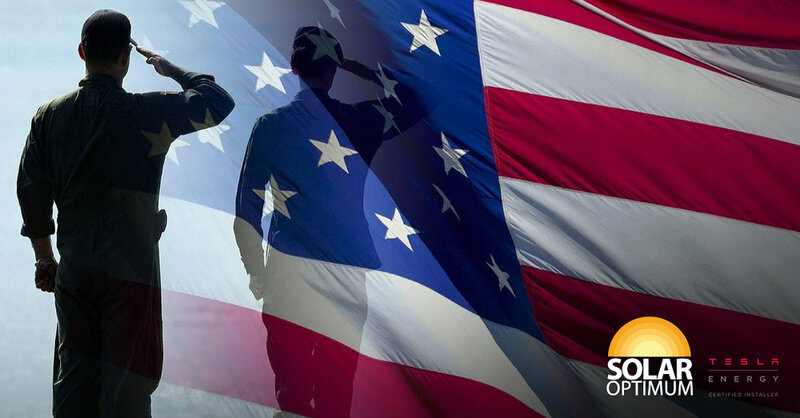 With 4th of July just around the corner, Solar Optimum is showing its appreciation and giving back to the brave women and men who allow us our freedoms by offering Energy Independence with its new Military and First-Responder Discount Program. Click the link or give us a call at 818-745-1493 to leverage this special offer. Thank You L.A. For 6 Years In A Row! What Does the Recent Solar Tariff Mean For You?